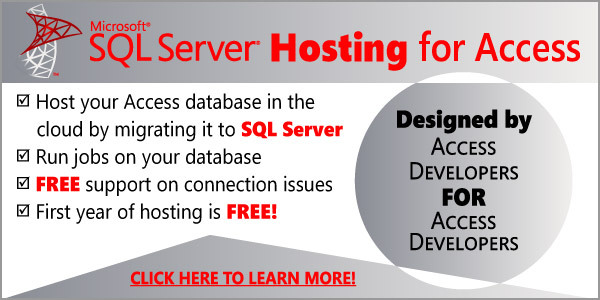 .ConnectionString = "Provider=SQLOLEDB;Data Source=ServerSQLExpress,1433;Initial _ Catalog=MyDB;User ID=johndoe;Password=password"
MsgBox "Can't open connection. ", vbInformation, "Error:"
.Open "Select * from tblClients"
strSQL = "Select ClientID from tblClients Where State = 'IL'"
ExecuteMyCommand "Update tblClients Set State = 'IL' Where ClientID = 100"
If you love this article than consider subscribing to my blog here. I’m also available for speaking engagements and consulting on Access with SQL Server projects, you can contact me here. is unlikely to give the expected result when rrCursor = rrOpenForwardOnly. This is because rrOpenForwardOnly = adOpenForwardOnly = 0. Also I’m unsure why this function is declared as returning an ADODB.Recordset when there is no statement returning a value. I’ve been using my version of your code on a client’s site for some months now but today discovered the global connection can effectively become ‘poisoned’, requiring users to close and restart the database. Stepping through the code, I found that ‘con’, the ADODB.Connection remained in the open state (con.State) yet it remained unusable by OpenMyRecordset() until it had been closed. I suggest the error handlers of OpenMyRecordset() and ExecuteMyCommand() should execute con.Close to prevent the second error and all its repetitions. I found your info on Easy ADODB and after figuring out what the connection string should be, this worked quite well. It would be nice to have a list of recommended entries in the tblProgramOptions table. Apparently, the only required one is the connection string. Everything worked until I did a single record insert. Then I got an Error 3704 but I realized that the record was actually correctly inserted. The problem was if the .EOF AND .BOF code. I changed this to if rs.RECORDCOUNT 0 and still got the same error. Then I added a test to see if the SQL String contained an “Insert into” and skipped around the error. Thanks for providing this information and code. It’s very refreshing to find code that actually works! I used some your methods to move most of the front end queries from access to TSQL resulting in huge performance gains, so on behalf of my users Thank you! I am in the process of integrating a third party database into our system which uses a nText field to store a CHR(13) delimited list. When I try to get this as part of the ODBC easy routine and a stored procedure this field is blank. I can get the value only by doing a lookup on a linked table. Is there any thing I need to do to return ntext fields? i find it hard to edit my ADODB, the text entries are saved successfully to issue_bk database table, but I cannot edit the booksinformation database table for Qty in Stock after minus Number of Books borrowed ..i hope someone here or u understand the difficulties im facing n help me out… thanks. El error que aparece es Bloque with no declarado. El procedimiento almacenado es el siguiente. Thank you for posting this easy to use code. I’ve got a problem though, perhaps you could point me in the right direction? I use the OpenMyRecordset to get the results from a stored procedure from SQL Server 2014 in Access 2013. One of the fields is of type nvarchar(max). If I link to the table directly in Access, this field shows up fine, but with the OpenMyRecordset the contents of the field are garbled. Any idea how I can fix this? hi, thank you for share code, It is very great. May you show me how to close connection? https://accessexperts.com/wp-content/uploads/2011/01/EasyADODB.txt contains strText but where is strText defined? The following runs when the user clicks the “Find Student” button after entering in text into the EnterText textbox. It should run the stored procedure and load the listbox, which contains LastName, FirstName, and StudentID. I’m sorry to hear you are having problems migrating your ADP project. As a consulting firm, we can certainly help you with this issue, would you want someone to contact you about it? Thank you for the offer, but I think I can get the rest as I’ve migrated another of our ADP project. However, the Student Search screen in this Access DB is giving me problems. I normally use pass-through queries for stored procedures, but the query for the listbox isn’t picking up the EnterText textbox as a parameter. I was trying your examples with ADODB to see if that would work, but I can’t figure out how to assign a recordset to a listbox’s row source. Can you tell me what’s wrong with the code in my previous post? As a rule we don’t offer detailed consultation on the blog, may I suggest using UtterAccess.com for help? They are great at helping out people. Congratulations Juan for your great blog! I have one problem and I guess you are the one to ask for help. I’m working with an Access Database 2003, being managed from VS and ADODB. My problem is that the Access database is growing too fast, and it reaches 2 GB after 20.000 records, so it gives “Invalid Argument” error and I have to close everything, compress and Repair, and restart the process. Is there any way to avoid this grow and be able to process 100.000 records one shot? Thanks for liking our blog! Your best bet will probably be to use a temp table in your stored procedures to hold temporary results, thus avoiding having to call another stored procedure, or create a table in your database that stores temp results by UserID, avoiding having to rewrite your procedures. 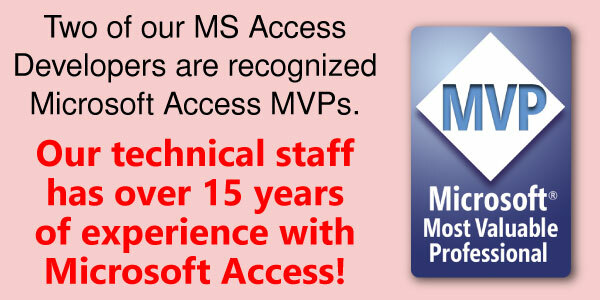 I will blog about this in our LinkedIn group MS Access with SQL Server, please join us there as well! Thank you Juan! Can you please let me know when you will post something about how to create temp tables so I can learn it. I need to start migrating to MSSQL my application ASAP. Best Regards, Tim. I’m assuming you meant temp tables in SQL Server? Great Work! After searching for hours on a solution to start a stored procedure by VBA you finally saved my day! Thanks for the post, it has been a big help. I’m having trouble though returning a recordset from a stored procedure. Do I need to duplicate the sql code that’s in the stored procedure and use the OpenMyRecordset function? I’ve tried ‘EXEC storedprocname param1’ as the strSQL string but it errors out at .open strSQL.